The Philadelphia Environmental Film Festival offers you a unique opportunity to communicate your brand to an active, influential, and growing audience. We would be happy to work with you to customize benefits to fit your mission and communication strategies. We also offer opportunities for in-kind sponsorship on a case-by-case basis. Why sponsor the Film Festival? It’s a one-of-a-kind event in the Philadelphia region. Our audience consists of informed, active, professionals, who are a diverse community of environmentalists, film lovers, and civic leaders. We reach thousands of people through our annual Festival, special event screenings, and outdoor summer film series. The annual Festival is an exciting chance to see exceptional new films and meet filmmakers and distinguished experts. It’s led by an experienced team, co-founded by a local environmental attorney and a LA film industry executive. 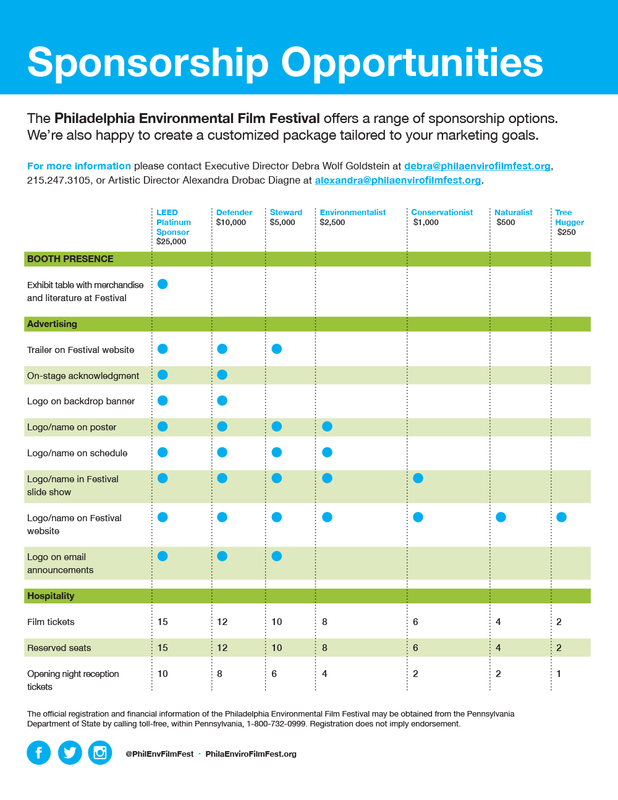 To DONATE/SPONSOR please click here or contact the Festival’s Executive Director, Debra Wolf Goldstein, at debra@philaenvirofilmfest.org.